Our younger Sisters traveled to Rome on pilgrimage for the conclusion of the Year on Consecrated Life. 20 years of food for the journey! Sr. Ann is celebrating 20 years (!!) of recording her daily radio program, Food for the Journey. Hundreds of people have had their lives changed because of this program. Thank you, Sr. Ann, for your tireless service to the people of God! On the Feast of the Immaculate Conception, 2013, Our Lady provided us with this amazing gift: a first class relic of Saint John Paul II. Pray for us, Saint John Paul. 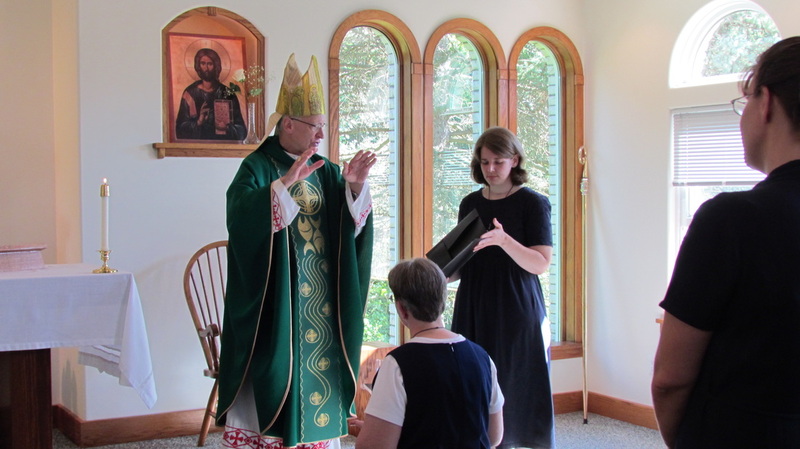 On August 16, 2013, Bishop Earl Boyea (Diocese of Lansing) witnessed the installation of Sr. Dorcee as Superior for six more years. 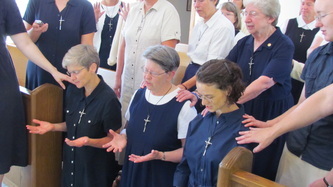 Her Council consists of Sr. Sarah Burdick and Sr. Rebecca Mierendorf. Sr. Dorcee and Sr. Sarah attended the three week CMSWR Summer Program held at their House of Studies in Rome, On Saturday, July 20, 2013, they "happened" to be in St. Mary Major when Pope Francis made an unannounced visit in order to pray for his trip to WYD in Brazil. 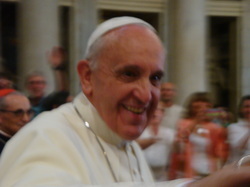 Here is a photo of him (which was not taken with a zoom lens) which shows you how close they were to him. Needless to say, they floated home. If you want to read more about their time there, you can go here. On April 23, 2013, Huron Valley Catholic School awarded the St. John Bosco Award to the Servants of God's Love in " recognition of longstanding contributions to the development of academic, character, and spiritual growth of Catholic youth." Many of our sisters are involved in education in various schools, but have been at HVCS the longest, almost since its beginning. We have contributed over 70+ years of teaching at that school. Three of our sisters are alumni (and we hope for many more!). Sr. Ann received the Aggiornamento Award in early April 2013. 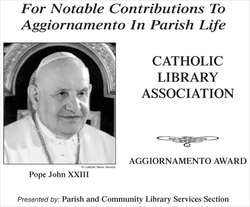 This award, established in 1980, is presented by the Parish and Community Library Services Section of the Catholic Library Association through the Aggiornamento Award Committee. It is awarded annually in recognition of an outstanding contribution made by an individual or an organization for the renewal of parish and community life in the spirit of Blessed John XXIII (1881-1963). You can find out more--and read more about her receiving this honor--here. "On Sept. 6, 2013 at St. Mary Cathedral in Lansing, Sister Ann Shields, S.G.L., was a recipient of the Benemerenti Medal. awarded by the Holy Father as a mark of recognition to persons in service of the Church. An internationally noted conference and retreat speaker and author of Deeper Conversion, To Be Like Jesus and other books on Catholic spirituality. She is a member of The Servants of God’s Love, a charismatic religious community established in the Diocese of Lansing. She is currently the host of the daily radio program Food for the Journey, a columnist for the diocesan magazine Faith and a staff member of Renewal Ministries, which is dedicated to fostering renewal and evangelization in the Catholic Church."